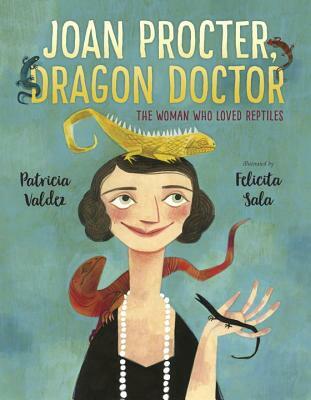 For fans of Ada Twist: Scientist comes a fascinating picture book biography of a pioneering female scientist--who loved reptiles! Back in the days of long skirts and afternoon teas, young Joan Procter entertained the most unusual party guests: slithery and scaly ones, who turned over teacups and crawled past the crumpets.... While other girls played with dolls, Joan preferred the company of reptiles. She carried her favorite lizard with her everywhere--she even brought a crocodile to school! When Joan grew older, she became the Curator of Reptiles at the British Museum. She went on to design the Reptile House at the London Zoo, including a home for the rumored-to-be-vicious komodo dragons. There, just like when she was a little girl, Joan hosted children's tea parties--with her komodo dragon as the guest of honor. Patricia Valdez is a scientist who loves writing for children. She earned her Ph.D. in Molecular and Cell Biology from the University of California, Berkeley and currently works at the National Institutes of Health. Originally from Texas, she now lives in the Washington, D.C. area. This is her first picture book.